​The Model 4T Tube Flanging Machine is used for the flanging of tubes. The 4T Upper Tube Flanging Roll has a knuckle radius built in to the Roll. The tube is loaded horzontally. The end of the tube that is to be flanged is placed into the machine. The other end of the tube is supported by a Tailstock Device. After the tube is flanged, it can be removed from the machine; or, if it is required that the other end of the tube should be flanged, then the flanged tube is removed from the machine, the Tailstock Device is moved forward by actuation of the Carriage Cylinder, the tube reinserted into the machine, then flanged. The Model 4T has a 7 1/2 HP Main Drive Electric Motor. The maximum flange height that can be achieved on the Model 4T Tube Flanger is about 3" / 75mm. If a larger flange height is required, please consider the Model 6T, or 8T Tube Flanging Machine. We normally construct this machine with a 72"/1830mm maximum diameter capability. Larger diameter tubes can be flanged on this machine by placing a spacer under the Base of the Machine, or between ​the Base of the Machine and the Machine Head. 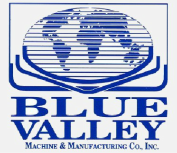 Blue Valley Machine & Manufacturing Co., Inc.